Dimensions 18.0 In. X 13.0 In. X 3.0 In. I purchased these mats with the towels and couldn't be happier. They are thick and plush and very absorbent. I washed them all together and had to clean the drier lint screen three times before they dried. I used them after the first wash and have not noticed a lot of lint, but they did plush up quite a bit. Very classy looking and appear far more expensive than they are. very soft and durable. Everything about these Turkish cotton bath mats is just what I expected. I cannot find for some reason this type of mat sold locally. 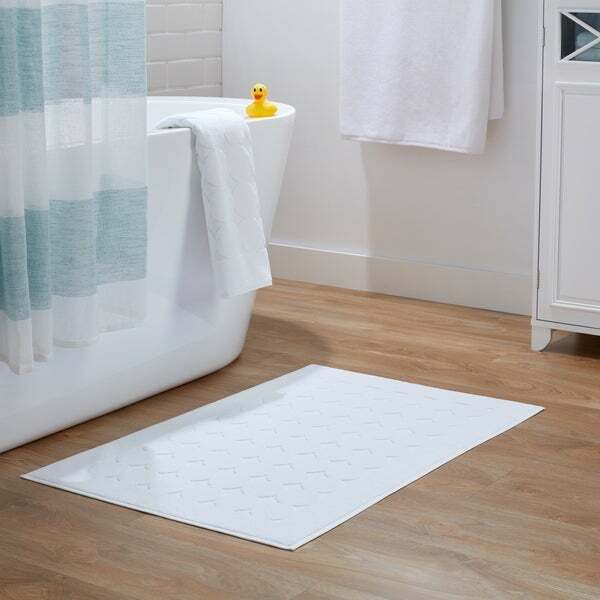 I prefer the cotton bath rug such as this is to much of what is commonly found in a mat. It dries between showers and it washes and dries with no problems such as the rubber backed mats. It is too big for the area I have; I should have paid more attention to the measurements, but doubling it work okay. Love the Polka Dots or Circles if You Like! I have been searching for regular cotton bath mats for many years. I also wanted plain old white. They are something you can have for years. I also didn't want the Turkish key pattern or the rectangular border. Finally on Overstock my search came to an end when I saw these bathmats. To make things even better, they have a cute polka dot design. I should call them circles, as they can look sophisticated as well. It depends on how your bathroom is decorated. I have washed them both twice now. They did shrink a bit, but they are oversized compared to every cotton mat I have ever seen. They are nice and soft and feel great when you step out of the bath or shower. . I highly recommend them. They are so hard to find especially if you want something with some style. I would buy them again in a heart beat!. Excellent quality foot mat. I was looking for a towel-like foot mat that is easy to laundry. Most of the floor mats I encountered had rubber lining that usually starts to flake off after a few laundry runs. These towels are thinner without the backing. They take less space in laundry machine and are much more sanitary, in my view. 100% cotton is nice touch! When these Turkish Cotton Bath Mats arrived, I was so surprised at how big they are. Washed them expecting them to shrink a lot, and they didn't. They are so large, I fold them in half which makes them even thicker and softer. I am very pleased with this purchase and would recommend them to others. Very glad to have purchased these cotton bath mats. They are just what I was looking to add to my shower. 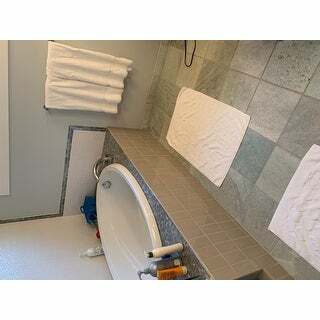 Described well on the website ... Hotel and Spa is a good representation for these bath mats. Large and thick, exactly what I was looking for. I highly recommend! These are the hotel style bath mats (small thick towels), very hard to find locally. These are excellent quality bath mats. Very soft floor towels! Great price. Would not call it mats. The circle pattern is cute. Don't be deceived by the description - these are NOT bath mats! They are essentially hand towels! They are not thick enough nor do they have the correct heavy or non-slip backing to be considered bath mats. You may as well just lay down a towel. I feel deceived by the description and the poor quality of the photo. And to top it all off, overstock does not provide free returns so I ma essentially paying a $$% restocking fee to return this item that is not what it claimed to be. Buyer Beware. We like larger bath mats and they are getting hard to find. These were the same size as advertised, thick, without blemish and very absorbent. I wanted a special type of bath mat for house guests and these are it! They are a nice size, larger than most, and are completely washable. I just love them! Larger than average bath mats ... these are very good quality! They are a bright white and are thicker than a high quality bath towel. Would highly recommend. Love these bath mats !!! They are very thick and plush!!! I got these to go with my white towels. They work well together, same company. These are nice to use, soft, but dry well. These are the second set I have purchased. These are very very thin. I was thinking they'd be similar to the bath mats I've seen in hotels, but they're not quite the same. This may seem like an odd complaint, but they're too large -- I can't easily tell them from the bath towels when I'm doing the laundry. If these were thicker, but smaller in dimension they'd be exactly what I was looking for. These are fantastic and look as good as the day I received them( after many washes). Will buy again as the mats can be described as luxury at an affordable price. Very good mats for the price. Highly recommend. Great quality and thickness. Beautiful in white, very elegant. They are soft, thick, and absorbent; and the pattern has so much dimension that they look more like rugs than mats. I just ordered another pair. "I am still confused....what are the dimensions of these mats? Are they both the same size?" These are 2PC Set of Circle Design Bath Mats and the dimension is 24”W x 35”L. "what are the dimensions? 13x18 or 24x25?" These mats are 24 inches x 35 inches. "Are these chlorine bleach safe." I wanted reversible all cotton white bathmats.